For the Ukrainian sister airline, see Azur Air Ukraine. For the French airline, see Aigle Azur. Azur Air (Russian: Катэкавиа), formerly Katekavia, is a charter airline and former regional airline in Russia. Initially it was based out of Krasnoyarsk Cheremshanka Airport, the domestic airport serving Krasnoyarsk, and its destinations were all within the Krasnoyarsk Krai. Nowadays it mainly serves leisure and some domestic destinations. The airline started operations in 1995 and operates regional flights out of Krasnoyarsk Cheremshanka Airport and Krasnoyarsk-Yemelyanovo Airport. The airline also operates charter services to Siberia and Yakutia. It carried around 122,000 passengers in 2009, and in 2010 started to acquire larger aircraft, mainly the Tupolev Tu-134. As of 3 April 2014, it has three Tupolev Tu-134s. In April 2014 the airline commenced scheduled flights between larger Krasnoyarsk-Yemelyanovo Airport and further cities in Siberia: Surgut and Tomsk. The airline received international media and social media attention in 2014, when a video emerged of passengers on a scheduled flight from Igarka to Krasnoyarsk disembarking pre-departure to push their plane in temperatures of minus 52 degrees Celsius after its chassis froze. In 2015, Katekavia was rebranded as a leisure carrier and renamed Azur Air. In December 2015, it has been confirmed that former owner UTair Aviation sold Azur Air to Turkish tourism company Anex Tourism Group which also bought Azur Air Ukraine, the former UTair-Ukraine, a few weeks earlier. Belgorod Russia EGO UUOB Belgorod International Airport! Irkutsk Russia IKT UIII International Airport Irkutsk! Moscow Russia DMD UUDD Domodedovo International Airport! Novosibirsk Russia OVB UNTT Tolmachevo International Airport! Omsk Russia OMS UNOO Omsk Tsentralny Airport! Saint-Petersburg Russia LED ULLI Pulkovo International Airport! Ulan-Ude Russia UUD UIUU Baikal International Airport! 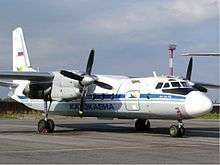 On 3 August 2010, a Katekavia Antonov An-24 crashed on approach to Igarka Airport, killing twelve people. The crash was caused by pilot error. As a result of the crash, the Russian government started to investigate how Katekavia operated their flights. 1 2 "Авиакомпания «КАТЭКАВИА»: регулярные и чартерные перевозки по России, доставка грузов, самолёты в аренду". Katekavia.ru. 4 July 2012. Retrieved 4 July 2012. ↑ "Katekavia". Aviation Safety Network. Retrieved 3 August 2010. 1 2 "russianplanes.net ✈ наша авиация". russianplanes.net. 3 April 2014. Retrieved 3 April 2014. ↑ "Passengers forced to push their frozen plane in Siberia". Retrieved 27 November 2014. ↑ "Siberian Sun". Airliner World: 8. July 2015. ↑ "Crash: Katekavia AN24 at Igarka on Aug 3rd 2010, impacted ground short of runway". Aviation Herald. 2010-08-02. Retrieved 2010-08-02. ↑ "Самолет российской AZUR air экстренно сел в Ташкенте". Gazeta.Uz. 2016-03-26.